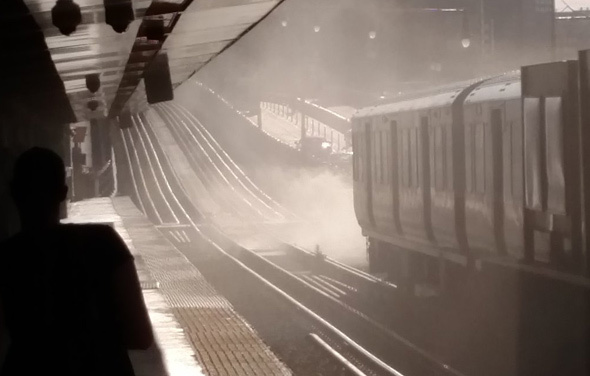 A heap of trash on the tracks at Charles/MGH naturally chose rush hour to combust into flames, causing delays on the Red Line. The MBTA is reporting Alewife-bound delays of up to 20 minutes due to a train with "a power problem" at Charles/MGH. A Quiet Philodox shows us the trash fire at Charles/MGH around 6:15 p.m. 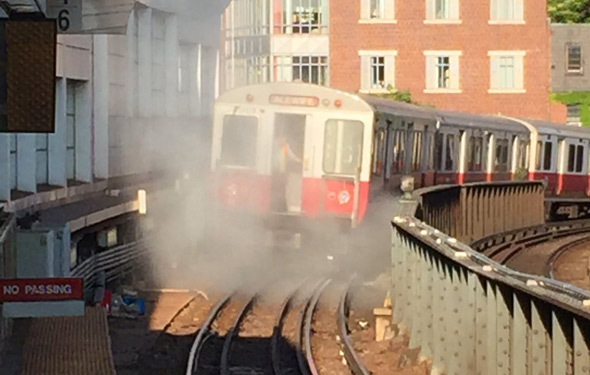 The MBTA reports the train operator was able to extinguish the fire and get the Red Line running again. An Alewife train got sick at Charles/MGH (well, if you're going to get sick, that's the place to do it), and now the Red Line is running kinda slow in that direction. Transit Police report arresting a man they say got on the Red Line at Charles/MGH last Tuesday morning and "stated he would blow everybody up." Jam and cram at Charles/MGH. Midwinter's Wolf reports Charles/MGH turned into a mosh pit this evening when an inbound train died there shortly before 6 p.m. and the T ordered everybody out after another train arrived to push it into the Charles out of the way. Only the platform was so crowded not everybody could get off the train. Read more. Another Red Line train has taken the siding to Valhalla, this time at Charles/MGH. 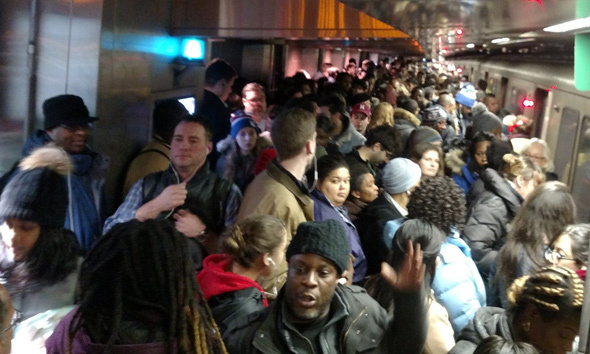 The MBTA reports "severe" delays due to a Norwegian Blue of a train inbound at Charles/MGH. The T has pushed the inbound train out of the way, but still reports "moderate" delays on the Red Line. Yesterday, a Red Line train died on the outbound tracks near Charles/MGH. Today, a Red Line train's dead on the inbound tracks near Charles/MGH. The word of the day is "severe," the T advises. A Red Line train came up lame at Charles/MGH outbound and now the MBTA is reporting "moderate" delays. An Orange Line train stopped at North Station and refused to budge, but the T reports it made it budge and now things are back to normal on that liine. The MBTA is reporting "moderate" delays on the southbound side of the Red Line due to a train that couldn't be revived even by the doctors stationed just outside Charles/MGH. Christina Visconte reports: Read more. The T is reporting "moderate" delays on the Red Line because of a train that flatlined at Charles/MGH. Climbed back in and kept going. The T is warning of "moderate" delays in both directions on the Red Line due to a track problem between Kendall Square and Charles/MGH (which would be, what, the Longfellow?). UPDATE: At 8:20, the T reported delays southbound due to a train that met its maker at Alewife. 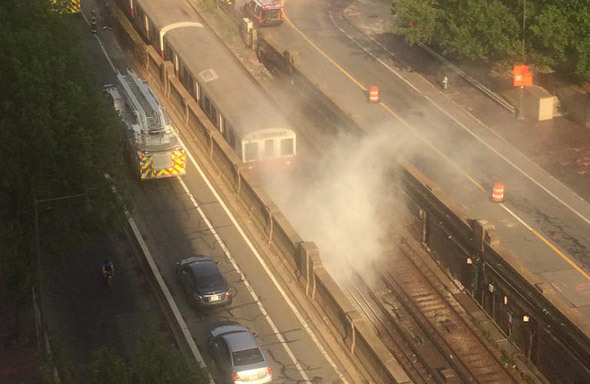 Firefighters had to foam down a smoking Red Line on the Longfellow Bridge just past Charles/MGH around 6 p.m. Gabriel Fishman, who captured the scene just as firefighters arrived, reports they made short work of whatever the problem was and that service seemed to start up not long after. Alison Loat marveled at the guy on the other platform at Charles/MGH today.